History & Styles of Famous Artists Involved in Genre Painting in Ireland. style Irish artist Stanhope Forbes. Of all the five major types of painting, the one we call 'Genre scenes' is the most difficult to define. There are at least two reasons for this. First, because the line separating landcapes (even portraits) from genre-painting is fuzzy, to say the least. Is Sean Keating's 'Men of Aran' - or Paul Henry's 'Turf Gatherer' - a landscape or a genre scene? Is Sarah Purser's 'Petit-Dejeuner' a portrait or a genre scene? It's hard to say. Secondly, if the essence of a genre work is the 'depiction of a scene from everyday life', must it be executed in a representational style, or can it be semi-abstract? If the latter, how abstract can it be before it ceases to have any value as a genre painting? rural style Irish artist Paul Henry. These questions make it extremely difficult to attempt any precise classification or explanation of this type of art. Nevertheless, we must start somewhere, so while not laying down any precise rules, we will assume that genre-painting incorporates all paintings attempting to convey a message about everyday life, provided that they are sufficiently realist in style to be instantly recognizable. Irish painting began with portraiture, during the mid-seventeenth century. Landscapes, initially no more than pretty topographical pictures of country estates, became popular only later, from roughly 1730 onwards. Not until the nineteenth century was there sufficient commercial interest, or sufficient confidence among artists perhaps, to warrant the production of genre paintings. Even then, most of the early works were done by the 'European' element among Irish artists, who were imitating the style and subject matter of Barbizon plein air painting, or by their London-based colleagues. Indeed, there was no real interest among Irish patrons for genre-works, until much later in the century. of urban life, Richard Moynan. Towards the end of the 19th century, however, fuelled in part by a desire to capture the essence or at least the authentic nature of Ireland and its people, Irish genre-painting grew rapidly and in a variety of styles and subject. Of these, at least six are worthy of note. (1) The established Continental or French style. (2) The established Anglo-Irish academic style. (3) The rural or traditional Ireland style. (4) The modern Irish style, typically of urban scenes. (5) The contemporary, expressionist or colourist style. (6) The singular style of Jack B Yeats. 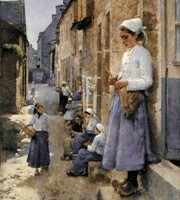 This style - which accounts for most of the greatest genre paintings produced by Irish artists - was pursued for much of the 19th century by Irish artists who went to Belgium or France to work with European artists in places like Barbizon, Pont-Aven, Concarneau and other provincial centres in Brittany. Although their primary aim was to absorb the plein air methods of landscape painting, they also portrayed day to day genre scenes of ordinary life. This style is exemplified in the works of Augustus Nicholas Burke (1838-91) (eg. 'On the Apple Tree, Brittany', 1876) and Aloysius O'Kelly (1853-c.1941) (eg. 'An Interior, Brittany', 1935), William John Hennessy (1839-1917) (eg. 'A Secret, France', 1889), Joseph Malachy Kavanagh (1856-1918) (eg. 'Old Convent Gate, Dinan'), the Impressionists Roderic O'Conor (1861-1940) (numerous Breton scenes), Walter Frederick Osborne (1859-1903) (eg. 'Apple Gathering', 1883), Nathaniel Hill (1861-1934) (eg. 'Brittany, Sunshine), Stanhope Forbes (1857-1947) (eg. 'A Street in Brittany', 1881) and later by William John Leech (1881-1968) (eg. 'The Goose Girl', 1914) and John Lavery (1856-1941) (eg. 'Under the Cherry Tree', 1884). This style was followed by several home-based Irish artists, such as Sarah Purser in her work 'Petit-Dejeuner'. These genre paintings, especially the pictures from Brittany, remain among the most sought-after works in the history of Irish art. For details of the highest prices paid, see Most Expensive Irish Paintings. 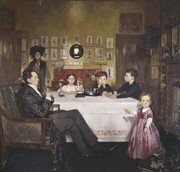 The leading exponent of this style is William Orpen (1878-1931), as exemplified in works like 'The Cafe Royal in London' (1912) and 'A Bloomsbury Family'. Another exponent, in pencil and chalks, was Frederick William Burton. This variant of Irish genre-painting divides into indoor and outdoor scenes. The former is exemplified by James Brenan (18371907) (eg. 'Letter from America'), while the latter is illustrated in works by Paul Henry (1876-1958) (eg. 'Launching The Curragh' among many others), and George 'AE' Russell (1867-1935) (eg. The Potato Gathers). Sadly, the nostalgic efforts of some artists to capture the authentic everyday culture of the West of Ireland, ended up glorifying the lives of its poverty-stricken inhabitants. Also in this category are scenes of the land war in Ireland during the 1880s, such as 'An Irish Eviction, Co Galway (1889), by Henry Jones Thaddeus. 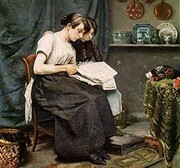 An early notable exponent of this type of genre-work was Richard Moynan (1856-1906); see for example his 'Girl Reading A Newspaper', or 'Afternoon Tea'. It is also exemplified by Walter Frederick Osborne (1859-1903) (eg. 'In the Phoenix Park: Light and Shade', 1885); Leo Whelan (1892-1956) (eg. 'The Doctor's Visit' 1916, and 'The Kitchen Window'); the numerous working-class Belfast genre-scenes of William Conor (18811968); Margaret Clarke (1888-1961) (eg. 'Interior of Room', 1920), Cecil Maguire (b.1930) (eg. 'Sheep For Inishlacken'); and in a wide range of Dublin genre-scenes by Patrick Leonard (1918-2005), urban scenes by Gerard Dillon (1916-1971), and Belfast street pictures by Colin Davidson (b.1968), to name but a tiny handful. See also the contemporary realist style of representational painting in Ireland, as exemplified by Norman Teeling (interiors), John Morris (beachscapes), Henry McGrane (rural genre scenes) and Paul Kelly (coastal genre scenes). See also: Oil Painters of Ireland. This category encompasses modernist genre paintings which contain interesting messages, or expressionist imagery such as the quirky genre scenes by Robert Ballagh (b.1943) (eg. 'Two Men and a Lichtenstein'), expressionist genre pictures by Graham Knuttel (b.1954) (eg. 'Man and a Woman at the Bar'), and the colouristic work by Rasher (Mark Kavanagh) (b.1977) (eg. 'The Edge of the Seat' 2001) and Chara Nagle. These contemporary painters are creating a new 'international'-type of style in the visual arts of Ireland. Yeats' ability to produce iconic images of early 20th century Ireland is nowhere better expressed than in his genre paintings and drawings. Works by Jack B Yeats like 'The Wake House', 'Waiting', The Man from Arranmore', 'Riverside, Long Ago' and The Small Ring', to name but a few, are wonderful examples of his empathy and sureness of touch. Fused with realism, his pictures are laced with narrative and moment.  For more details of contemporary genre-painting in Ireland, see: Homepage.